NEC SL1000 PBX Keyphone PABX System delivers plenty of built-in features for you needs. 1. Auto Attendant feature is built-in without additional hardware and is able to record up to 4 greeting messages by the users. It also keeps up to 10 messages to be recorded from outside. 2. Caller-ID feature helps you to identify who has been contacting your office. 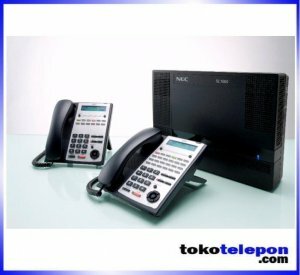 NEC SL1000 PBX can interface the Caller-ID trunk from telecom supplier and the information can be displayed on all types of terminals. Incoming ring tone can be set against specified Caller-ID numbers, allowing identification by the ring tone. 3. Group Listening allows you to broadcast your conversations via the built-in speaker on the multiline terminal. This enables your surrounding parties to listen to the conversation. 4. Join a conference without even leaving the desk. This feature allows you to set up a teleconference between internal and/or external parties. Remote Conference is also available where internal and/or external parties can access to virtual conference room with password. 5. Hotline feature is ideal for reception, security guard houses, parking attendants, and etc. Set up the terminal for dedicated use. This function allows you to call pre-assigned extension or external number by just lifting the handset without dialling any numbers. 6. Day / Night Mode allows you to control incoming calls and outgoing calls after working hours. NEC SL1000 PBX provides up to 8 system modes which can be switched either manually or automatically. 7. Call Forwarding feature enables incoming call to be redirected automatically to another extension or an external number (mobile phone, home phone etc). 8. Proprietary Door phone terminal connections at the front door. Additionally, if nobody is in the office, then there is an option that the doorphone ring call can be forwarded to your mobile or home telephone. 9. Toll Restriction feature prohibits specified extensions from accessing unauthorized numbers which have been pre-programmed into the restriction table. A total of 15 restriction classes can be assigned to each extension. 10. Extension Lock with security code allows you to prevent unauthorized personnel from making calls from your extension while you are away from your desk. 11. Long Conversation Alarm / Cut-off. This alarm feature provides callers a beeping tone periodically to remind them. The cut-off feature can be used to disconnect external calls forcefully after the pre-programmed time limit to cut down communication cost and increase efficiency of employees. 12. Web-based System Management allows administration of the system has never been easier with the intuitive Graphical User Interface (GUI). Your own PC can be connected to SL1000 to let you edit/change/manage various terminal settings.